is just what I need and don't have. I've spent the last couple of days preparing the ground. I have broad bean seeds, onion sets, peas all waiting to go into it and I have not the slightest idea where to put them. Oh, I have some vague notion. I've read all the books and with an inbuilt fear of bowing to any authority I have airily mashed them up in my head with the full intention of synthesising a better, more comprehensive and efficient new order. This lofty ambition seems to be way beyond my remaining brain cells. Frankly, the back of an envelope with coffee stains on it looks better than my mental map at the moment. Such lackadaisical method as I have is broadly this. Cover a patch of ground in the autumn, call it the new potato patch. Come the spring, dig it and plant potatoes. The beans. peas and pumpkins go into the old potato patch and everything else follows into their vacated spot. However, after four, no, five years of this mayhem I'm running out of new places for the potato patch. This year they're going to be a clearing crop for my oft delayed herb garden but that will be the last time they can dig their toes in the soil there. 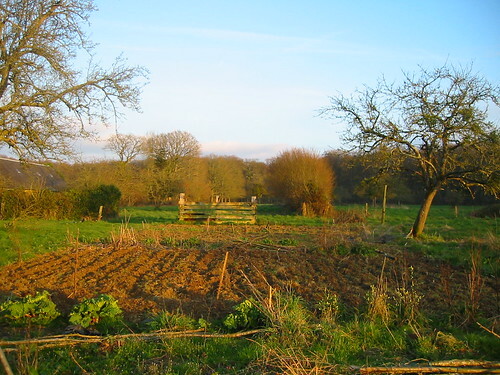 The very first potato patch is going to be returned to nature as it is irredeemably stony compared to almost anywhere else on the planet and I am going to have to start re-using land unless I plan to put the whole 9 hectares over to vegetables through the coming seasons. Tonight, I will make that plan. Probably. 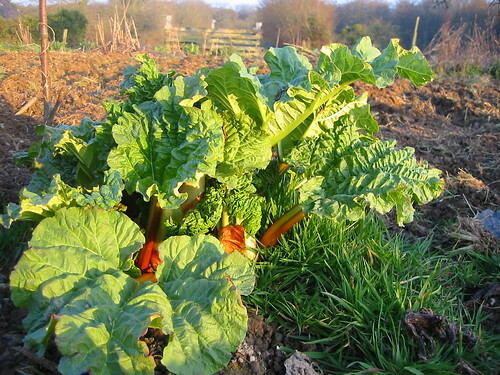 In other news, the sun finally came out this evening for a brief moment so here is a picture of some rhubarb. More soon. i have got the book on square foot gardening - i think it may have been you who originally referred me to it? you need a larger scale version! Oh I have the book, it's the person with a pointy stick chasing me that I need to get me up and get stuff sorted! Still, raining today, ideal for sitting in front of the fire and making maps.